The intervertebral discs are spongy cushions found between the vertebrae in the spine. As we age, these discs dry out and harden, making them more prone to injury. The term “slipped disc” is misleading so instead you will hear your Osteopath say disc bulge. The disc doesn’t actually move out of place, but the tough outer fibers of the spinal disc weaken and stretch or tear allowing the “jelly like centre” of the disc to bulge outwards. A disc bulge is the first step to a more serious disc herniation and then prolapse. A herniated disc may put pressure on or “pinch” the spinal nerves as they exit the vertebra, this will often cause initial symptoms of pain referred down the leg(s) or arm(s) depending on spinal level of disc injury. How do I know if I have a disc bulge or not? Often a disc bulge will have no symptoms at all. In more serious cases you may experience pain down one or both of your legs often called “sciatica”. You may experience anything from dull or sharp pain, numbness, tingling or weakness down the leg and sometimes into the foot. You can also experience local moderate to severe low back pain. Typically these symptoms will appear suddenly after you may have lifted something heavy or twisted in an awkward manner. Yes and No. The diagnosis of a disc bulge/herniation is not one to be taken lightly. This is because it is really important that you look after the way you move and lift things so that the less serious bulge does not progress to a prolapsed disc. The most important thing to remember is that you can recover from the low back and leg pain cause by a disc herniation as a lot of the initial symptoms are a result of inflammation to the new site of injury. Remember you cannot actually push the contents of that disc back in. A herniated disc is generally considered to be more serious than a disc bulge and a prolapse is more serious again. What will my Osteopath do to help treat a disc bulge? Like other types of back pain a disc bulge is the result of what is going on in the rest of the body and the pressure being built up around the disc due to muscle and joint imbalances. This is where ongoing Osteopathic management and maintenance treatments are important. Disc bulges are quite a common problem diagnosed and treated by Osteopaths. Normal treatment would include rest from aggravating activity and a specifically tailored hands on and strengthening/stretching treatment aimed to mobilise the surrounding areas. We are aiming to loosen the muscles and to work to take pressure away from the herniated disc. As pressure within the disc is reduced the “pinch” on the spinal nerves is reduced which drastically reduces the pain and it also allows oxygen and nutrients to flow to the injured disc acting to aid in the healing process. Scoliosis is a medical condition in which a person’s spine is curved from side to side, and may also be rotated. 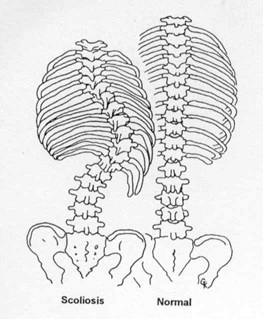 On an x-ray, the spine of an individual with a typical scoliosis may look more like an “S” or a “C” than a straight line. It is typically classified as congenital (caused by vertebral anomalies present at birth), idiopathic (sub-classified as infantile, juvenile, adolescent, or adult according to when onset occurred) or as having developed as a secondary symptom of another condition, such as cerebral palsy or spinal muscular dystrophy. As Osteopaths it is most important to ascertain the reason behind the scoliosis. As a rule of thumb the earlier it is detected the better, which is why we are so keen to exmaine your children to pick up on any scoliosis. This will determine the degree of success we have in halting the progression or reversing the scoliosis. Logically the sooner it is diagnosed the more impact we can make with treatment and lifestyle adjustments and/or advice. In the case of the most common form of scoliosis, Adolescent Idiopathic Scoliosis, the teenager can often have absolutely no symptoms. Scoliosis often presents itself, or worsens during the adolescence growth spurt. Symptoms can then occur later on once they have settled into their”adult” frame and they lose part of the flexibility and suppleness associated with youth. Trauma in an adult can cause scoliosis, whereby the pain, inflammation and spasm will twist or curve the spine away from the primary site. Curves convex to the right are more common than those to the left, and single or ‘C’ curves are slightly more common than double or ‘S’ curve patterns. Males are more likely to have infantile or juvenile scoliosis, but there is a high female predominance of adolescent scoliosis. Pain is common in adulthood, especially if left untreated. One of the major complaints from parents and patients is cosmetic deformity. Pain can occur, however, because of the muscles trying to conform to the way to the spine curving. However, this usually only happens in larger curves. As the curve keeps growing, there is more pressure in some prominent areas than others. This will also cause the muscles to seize up and become sore. Stand your child or spouse in front of you preferably with their shirt off. Take your time and look at the midline shape of the spine. Then look at the levels of the top of the bony pelvis on the sides, top of the shoulders, bottom corner of their shoulder blades and bottom of the earlobes. These are 4 landmarks that may help you to get a bearing of height differences. If you notice difference in any of these a thorough evaluation by your osteopath may be a good idea. Too often we treat these children once it is too late and they can suffer with chronic pain due to their scoliosis. Once a scoliosis is set by growth and time in the young it can never really be taken away so take the time and look at those you love. Many of us know of inherited characteristics that we can see physically or behaviorally in our offspring. Did you know spinal curves can be passed onto our children and grandchildren? It is always interesting when looking at a child to see one or both parents. Parents are always amazed when we have a through look at the postural habits of their young. As a general rule the younger the better to have an impact on these hereditary traits. Scoliosis (abnormal spinal curve) is more likely to occur when one or both parents have a curve. If you are an Osteopathic patient it may be wise to get your kids or grandkids checked for abnormal spinal curvatures. If detected during childhood or adolescence some of the problems experienced in adulthood can be prevented or minimized. Together with the appropriate lifestyle advice, the best possible outcome can be achieved during the growth phase so that they can be as settled and balanced later on in life.